Sony has recently discovered that the paint applied to the body of the Sony Cyber-shot DSC-T11 digital still camera has an increased susceptibility to peeling when the camera makes a sharp contact with metallic or other hard surfaces. 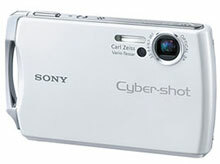 While the functional and operational capabilities are unaffected, Sony has decided to temporarily halt sales of the Cyber-shot T11 camera until the cause and remedy can be identified. The DSC-T11 camera was first introduced in the Japanese market on April 29, 2004. Sony expects to provide an updated announcement around the end of May, clarifying the sales status and remedy of affected Cyber-shot T11 cameras. We at Sony apologize for any inconvenience this issue causes you, and hope you understand that Sony is taking this action as part of our ongoing effort to maintain excellent product quality. Should you have any questions related to this issue, please contact the following customer support center.